Where will Elder Scrolls 6 be set? Skyrim is still one the greatest games you could buy. If you haven’t already and are looking for a game you can waste two hundred hours on, then that is one of the best choices. For eager Elder Scrolls fans, Skyrim has filled them, but now they want their sixth meal. While Bethesda are still content on releasing DLCs for the year old game, many already wonder about location, story and characters that will be involved in the next episode. We already debated on what the next DLC may have on, questioning if the start of the Thalmor war could be in Skyrim, on a DLC, to lure players back onto the game. The start of the rebellion would make sense in Skyrim, considering that many hate the High Elves. As for the story in the next game, we will leave that to another article. It will be a long article to cover the possible Thalmor war, the comeback of the Dwarves, Hammerfell, the Akarviri and all other elements that haven’t been fully explored. Setting could be anywhere, as we have already said, Hammerfell may be a suitable choice. The war against the Thalmor is much more fierce in Hammerfell, as the Redguards continue to go against the Aldmeri Dominion. We could see Elsweyr, the home of the Khajiit, although we are unsure what this will bring to the war with the Thalmor. Despite the Khajiit not really approving, they are not rebelling against the Aldmeri Dominion. In an odd move, we could see the Elder Scrolls game be set in Summerset Isles, the home of the High Elves. This would be brilliant as the war engages on all fronts, you may become the front line man, giving aid to whoever may be taking down the Thalmor. Or, you may gain the Thalmor’s trust and join them in battle. Of course, there is one huge option that Bethesda may have, if the Xbox 72o is out by the time the next Elder Scrolls game is introduced to the world. They could build the whole of Tamriel: Skyrim, Cyrodiil, Black Marsh, Morrowind, High Rock, Valenwood, Elsweyr and Summerset Isle. All the provinces are different and we suspect to do this would require a great amount of performance on the machine and a great amount of performance by the developers at Bethesda. The sands would have to be incredibly well designer, while the marshes would have to be dungy and gooie. 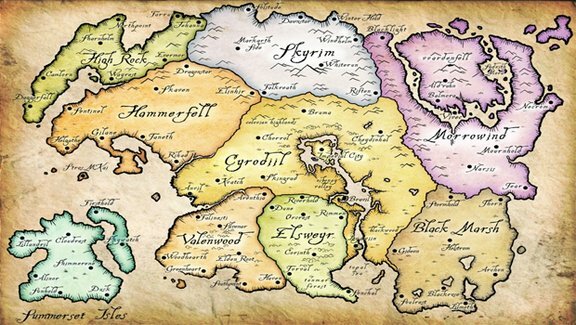 Overall, it would take a huge amount to make the whole of Tamriel your map and if Bethesda think about doing this for the next Elder Scrolls game then hats off to them. If that happens, they could make incremental upgrades to the Elder Scrolls available digitally, that set the time forward five or ten years.